It feels like a 'first try' product. Shark has an advantage over iRobot, Neato Robotics, and many of the other brands in our robot vacuum buying guide: It’s actually in the business of making vacuums. That gave us high hopes for the Shark Ion Robot 750, the top of its three-model foray into robot vacuums. 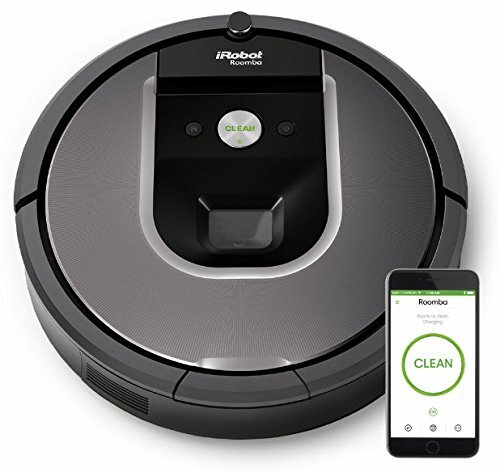 Unfortunately, while the $379 budget robot vac is a nimble navigator with a nice app, it’s cleaning fell short of our expectations. Shark didn’t attempt anything radical with the design. 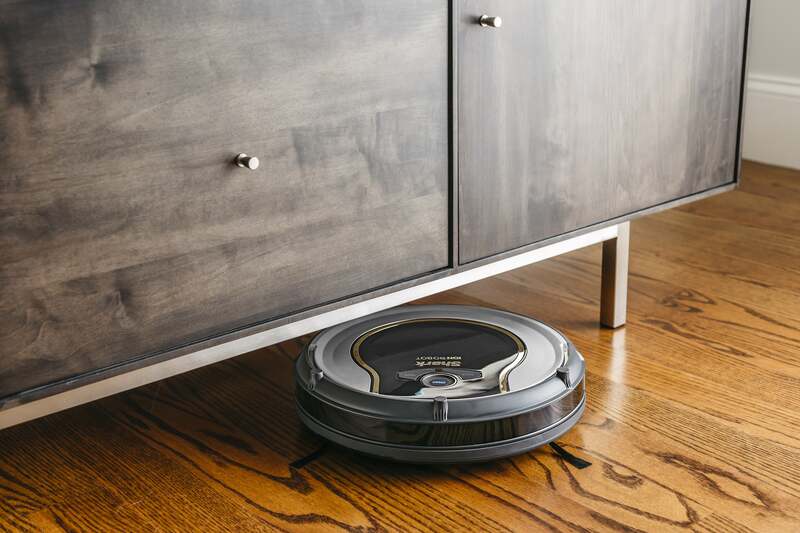 The 750’s circular shape and black-and-gray finish adhere pretty closely to the Roomba template—though its 12.6-inch diameter and 2.6-inch height make it more than an inch smaller than the Roomba 960 we tested. The dustbin is at the rear and slides out with the press of the button. On the bottom is a single roller brush and a pair of spinning side brushes. On top are three buttons for controlling the vacuum: one initiates a general cleaning, one a spot cleaning, and one sends it back to its dock for recharging. You can also control it using the companion app for iOS or Android, or using voice commands via Google Home or Amazon Alexa. Unlike most robot vacuums, the 750 doesn’t come with a physical remote control. Just under 3 inches tall, the Shark Ion Robot 750 can easily get in and out from under furniture. Setup is straightforward. Turn on the 750, settle it in its charging dock and follow the companion app instructions to connect it to the robot vac over your Wi-Fi. 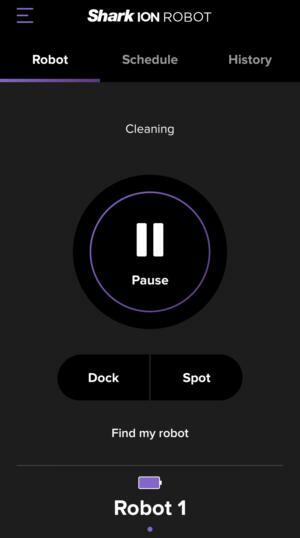 You can begin a cleaning by pressing the giant clean button on the app’s home screen or set dates and times for them to start automatically from the Schedule tab. Once a cleaning is complete, you can view data including the cleaning time and number of cleaning cycles displayed on the History tab. Like most robot vacuums at this price point, the 750 doesn’t include any sophisticated mapping navigation. It gets along by responding to information it picks up from its array of infrared sensors. Inevitably, this type of navigation results in haphazard cleaning paths as the robot vacuum feels its way through the room by bumping into furniture and walls and changing direction to find a clear path. The 750’s cleaning pattern was really random though. Each cleaning cycle of my downstairs space took around an hour—just about what the battery life promises—and more than once it spent at least half of that time in my half bathroom. It’s unclear if it just couldn’t find its way out of the closet-sized space, but whenever I realized I hadn’t seen it in a while, I’d look for it—either physically or by sounding its alert beep using the Find My Bot button in the app—and there it would be scrubbing the linoleum. The Shark Ion Robot app provides easy-to-use controls. Other times it would repeat a circuitous route through the kitchen and entryway while stubbornly avoiding the living room. I’d end up having to physically relocate it to whatever area it was ignoring in order to get a complete cleaning. The 750 had no trouble navigating around furniture and walls. It approaches these slowly and backs off as soon as it detects the obstacle, so you don’t have to worry about it scuffing your baseboards or taking a chunk out of a chair leg. And its low profile allowed it to easily get in and out from under my couch. It was also remarkably astute about avoiding tangles of electrical cords, shoes, and other stray objects that I was too busy, or lazy, to pick up. (Shark does include a length of magnetic boundary tape you can use to block off areas you want the 750 to avoid, if necessary.) The one issue it did have was getting stuck on lips between carpeting and hard floor, and more than once I had to nudge it over the hump. Cleaning performance was where I’d expected the 750 to shine given its pedigree. It was a mixed bag, though. It excelled at picking up pet hair, something our home has in abundance thanks to a quartet of four-legged family members. But it would frequently go over a patch of floor two or three times without picking up the food crumbs or scraps of paper littering it. And the 750 doesn’t offer a “turbo” mode or other way to manually kick up the suction in these situations. After each cleaning, there was plenty of debris in the dustbin but there was plenty more still on my floors. The Shark Ion Robot 750 is dead simple to use and you can intuit the app controls without consulting the tutorial overlay. And its Google Home and Amazon Alexa integration are an unexpected treat at this price point. But I found its navigation patterns too unreliable for me to let it run unsupervised and its cleaning too inconsistent. Ultimately, it feels like the “first try” product that it is. 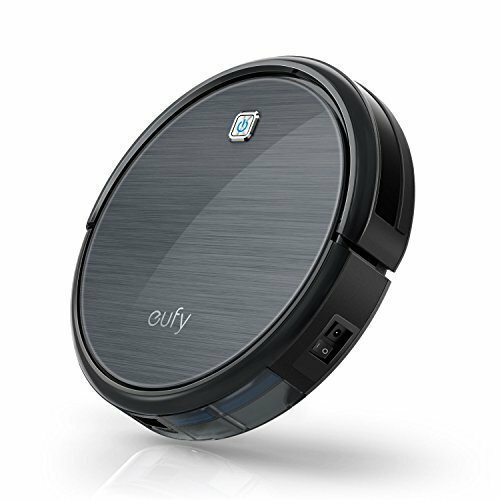 Future Shark robot vacuums will undoubtedly improve on these shortcomings, but until then we recommend you take a look at the Eufy RoboVac 11, which is cheaper and cleans better, if you’re in the market for a budget robot vac.